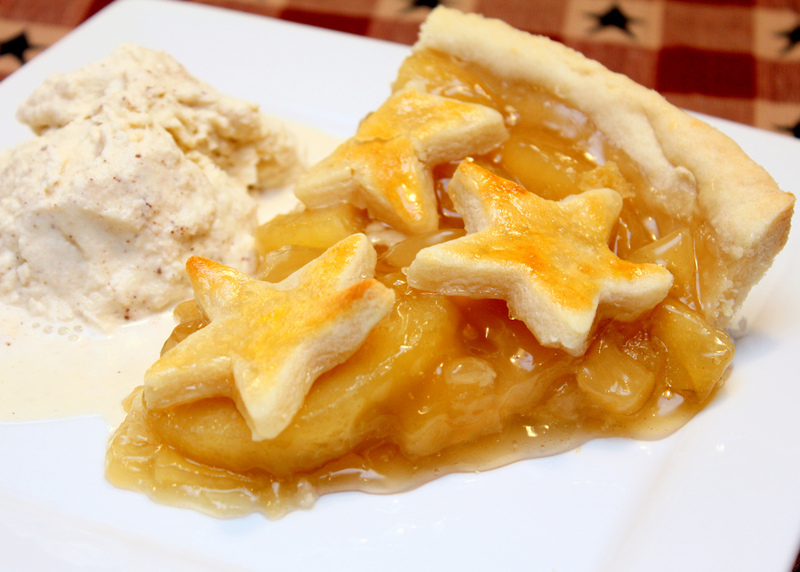 When I think of classic All-American desserts, pie always comes to mind. Especially apple pie! So I thought it only befitting to make one with a patriotic these for the 4th of July! This is actually the first pie I have ever made, so there was a lot of things I’ve learned. Like for instance, pie crust is extremely temperamental! At first I wanted to have a fully crusted top with three star shapes cut out, but we ran into problems :/ So I decided it would be easier to just cut out a bunch of stars and arrange them on the pie. Since this is my first pie, I didn’t want to make it too complicated. Not to mention, I had some left over apple pie filling, so I just concentrated on the crust. Which, in my opinion, is what makes or brakes the pie anyways. This pie crust recipe is one that my mom collected a long time ago. She makes it for all of her pies and it is super light and flaky. And super amazing! In the above picture I didn’t actually have a chance to let the pie cool all the way, cause people were already cutting into it, so I had like 2 seconds to put it on a plate with my still not quite frozen ice cream. If you let the pie cool completely, the filling won’t spill out like this. Tastes good either way though 😉 I posted the homemade ice cream recipe also. The pie and ice cream are super yummy together! Great apart too, but I can’t completely enjoy any pie or cobbler without a scoop of ice cream. Plus this Royal Homemade Ice Cream is the best ice cream I have ever tried! Enjoy!! Role out crust, place in pie tin, and freeze for 10 minutes. Remove from freezer and add filling. Role out remaining crust and add to the top. In a small bowl beat 1 whole egg and one egg yolk. Brush egg over the top crust. Bake at 350 degrees for 30 to 35 minutes. Let cool completely before serving.